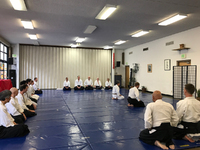 TriValley Aikido : 2019 Summer Seminar with Shiohira Sensei. Dublin CA. June 8th, 2019 Saturday. With Shiohira Sensei Shihan. You must sign up via the Dublin Rec website. You will be asked to create an account. !!! We do not have a activity number yet. We will send it out. The Autumn Aikido exam will be held at the Aikido Center San Francisco on Saturday September 22nd from 10:30 am to 11:30 PM. Everyone how testint be there before that time and already changed to 10:00 so that the exam can begin on time. Test practices will be conducted at Paly on 9/11 and 9/18 at 5pm, led by Sensei Neil Toda. Sign up this week or next at Paly and bring your uke. Please register by 9/8 using the form provided at Paly dojo. There's a general test fee of $20. For dan tests there's a more complicated fee schedule. Bring your Aikido passport. Please be sure to allow extra time to find parking (there is a parking garage underneath the Japantown Center; 5 min. walk from dojo and to navigate a slightly smaller changing room. Everyone is welcome (and encouraged) to attend the test, even if not testing. Address: 1755 Laguna St., at the corner of Bush St. in the lower level of the Konko-kyo church. The Spring PAF test passed in Aikido Center San Francisco on March 24th. Congratulations to Eduardo, Fushan, Tatiana and Filip on passing of the test! April Black Belt seminar is cancelled due to congestion in the area related to the Cherry Blossom Festival. See you in May. PAF Calendar. We had a terrific winter camp in Occidental. Cold, but no rain! Student Videos, Winter Camp 2018.